Before we have even polished off the bottle of whisky needed after listening to RIM’s painful figures, Nokia is heading our way with its second quarter results, due on Thursday. I would normally wait until results day before shedding a tear for what was once a great company, much like RIM, but with the news today it is slashing the price of its flagship phone – the Nokia Lumia 900 – to just $49.99 (£32) we all know there cannot be good news coming our way. The Finnish mobile manufacturer has struggled in the past few years due to the growing competition of smartphones from faster and sleeker developers at the likes of Apple, as well as missing the boat of adopting Android, whilst all the smaller guys grew from the partnership – again, much like RIM. But even the most cynical of us felt there may have been a slight light at the end of the tunnel when it teamed up with Microsoft. Windows Phone 7 is a beautiful piece of software and it excited those in the mobile industry, thinking there was finally something to turn the iOS and Android fight into a three-way battle. It seems though, despite even the hardware looking appealing to our eyes, the operating system has become a third wheel and is hanging around the cool kids asking to be picked but being left on the bench. 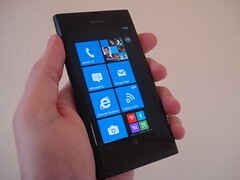 Windows Phone has not been the saving grace he had hoped and with Symbian dead as an operating system, it is hard to see which way the company can move next. Nokia has revamped the hardware, made a big bet on the software and thrown a huge amount at its marketing, but is still the traditional company who made our brick handsets back in the 90s and has now been put in the back of the drawer with all the old chargers. If the Lumias can’t bring it back into people’s pockets, I’m not sure what will. We will bring you all the figures and news from the company’s results call on Thursday.